I am still new to the hobby. Have been enjoying flying line of sight for a while, and still am as I am practicing flying. Recently I connected a GoPro to the Simple Cub and took it for a flight enjoyed the beatiful footage that it captured for a short amount of time before I crashed it into a tree . Check it out: Simple Cub with GoPro footage. What do you think of it? Is this good for someone that's trying FPV for the first time? Also what goggles could you recommend that are not expensive? or would you recommend going with a screen display? Is there a way to have the footage recorded? Looking good to me. A couple thoughts, 200 mW is more than enough power. More power just takes more battery. Life will be much easier if you camera & Tx will run on your flight pack voltage. Then just tap the balance lead. If your going to use a head set you will not use the Rx. With head sets you have to wear one to see if it works for you. Reviews are useful to,understand the features but you will not know if you can see well until you put them on. Ground recording is a must, also a self powered beeper. You will lose your plane & need the recording to get close to where it went down. You’ll need the beeper to find it when your close. You’ll want the beeper to work even if thee flight pack is ejected in the crash. I second the beeper. Sometimes where you think you crashed, and where you actually crashed are maddeningly far apart. 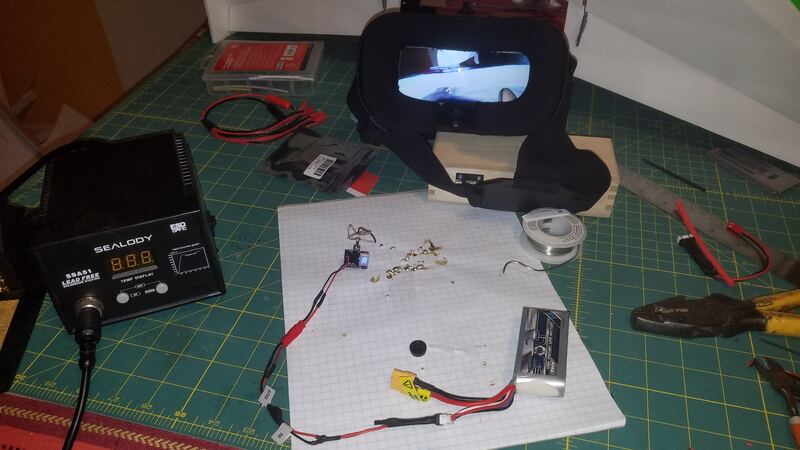 I recommend something like the quanum diy goggles, that's what I used getting into FPV. If you are confident in building ability, build a pair with some EVA foam floor mats or something and a backup monitor. @Crazy Goats do you have a explanation as to how I could build one? i just soldered this up. a wolfwhoop 200mW camera/tx combo, a micro BEC, and a balance plug. now i power the camera and tx off the main battery, drawing evenly off all 3 cells. wont loose signal until i loose the wing. i can also move this setup from the wing to any other airplane that i run a 3S battery on. i have a 4S connector as well, but haven't soldered it all together yet. I just got my wholfwhoop today as well! Unfortunately I don’t have any balance plug connectors, so I’m running off of a 150 1s lipo which doesn’t last long enough to put it on a plane, I’ll either get some balance connectors or I’ll (probably end up doing this one) get a new 1s. you can run this camera off a 1S -150 and still get 5mins, but you have to be very careful. you need a good battery to start with, then DO NOT plug it into the camera until just at take off. it is the last thing you do before taxiing onto the runway. don't plug it in at the truck, then plug in plane, then turn on goggles, then walk to field, then take off. that 1-2 mins is huge. This 1s is old and well used, I’m just gonna get a new one. The camera so far seems to have good range, and the video quality is really good, better than I was expecting, my only complaint is that it gets really hot, not to hot to touch, but hot. Just got to thinking and remembered I should have a 5-600mah 1s somewhere, I just have to find it. I was looking at these wolfwhoop AIO cams too, they are so small and cheap and actually available in Canada without waiting a month. Would be a really easy first FPV cam. I should have bought the WT03 with 200mW and RHCP when I saw it last week, they are out of stock now with only 25mW dipole ones available. Is there a reason these 5v cams need their own cell or BEC and can't just run off the servo rail? Too much noise and no filtering? I've just started in FPV too! You set the channel by DIP switches, some may not like that, but I see it as a plus, as I can set each aircraft to a known freq. But, this has gotten me in the air for next to nothing, so maybe later on I will trade up and get something fancier. Been playing with the OSD from the 405-wing and a bit spoiled by the ladder and all the info presented! wow, that is cheap. i have never come across that website before. thanks for the links, gonna do some looking. that system is not really small or lite though. my entire setup weighs 4x less than that transmitter. i'm @ 10g and could be lighter if you trimmed some wire and eliminated the connectors. my guess is you could almost half the weight. yes it is a little more, but not much more money. i guess that's all up to what you need and want as always. Turns out the battery wasn’t getting full charge, today I replaced the batteries in the duet transmitter (which also charges the battery) and got exactly 14 minutes out of it! That is a big improvement over the 4-5 minutes of before. Tomorrow the winds are supposed to be around 5-7 mph, looks like I’m going to get my first fpv flight in, I will update on how it goes. Another option for cameras is akk - http://akktek.com/products/micro-aio-cameras.html. They sell through Amazon if not comfortable with ordering from China. I hate to disappoint but, a video isn’t gonna happen for two reasons, first I don’t have any of the supported video hosts for the forum and second, I didn’t get fpv goggles with dvr. But on a brighter note, it’s looking like a good day to fly ! EDIT: By the way, I got these goggles. @Paracodespoder let me know how it went... I am looking to buy something very soon. I will do that, it will be a few hours, but I’ll let you know . Woohoo! This is so much fun! This setup works great by the way, I flew out probably about 1000 feet and still had good reception. This is my new favorite type of flying, being able to go a lot more places that you can’t even see, I’m hopefully going to get another flight in today.